It features an turn-of-the-century cowgirl smiling at you, the viewer. 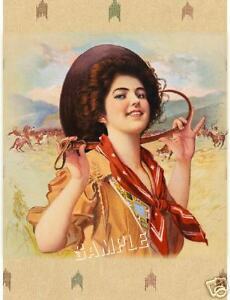 WONDERFUL ANTIQUE COWGIRL IMAGE! We have an ever-expanding gallery of exciting and unique ARTWORK for your consideration. It will surely grace any wall it hangs upon.